Waking up at 5am, we will wash up and then pack our backpacks ready as we will be leaving Hakodate for Noboribetsu later in the morning. We will then head to the Morning Market which opens at 6am to have a seafood breakfast there. We will probably walk around the market area and also take some photos before we head back to our hotel to rest. At the hotel, we would rest till 8.15am and then check out so that we can take a leisurely 20 minutes walk to the train station to catch the main JR Train line - Hokuto No.5 Express Train(above) to Noboribetsu which will depart at 9.30am. 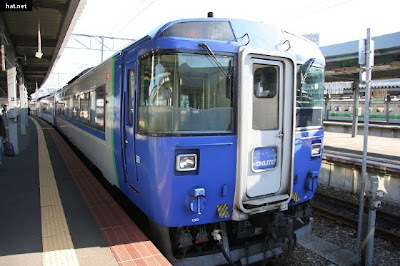 ( You can find out your required train schedule in Hokkaido at http://www.jorudan.co.jp/english/norikae/ ) The distance from Hakodate to Noboribetsu is 207km approximately and time taken will be 2hrs and 20minutes. We will most probably get reserved seats(below) which will cost us ¥6700(SGD$88)each. We will take the ride to Norboribetsu to catch on an hour of sleep and look at the scenery passing us. For those who do not know about Noboribetsu, it is directly south of Sapporo city, and since it runs along the coast and is surrounded by beautiful forested hills, scenery there will be picturesque. Of course, the main attraction of Noboribetsu is that it is the main hot spring resort area which boasts 11 different kinds of hot spring baths that are said to have medicinal properties. Also famous in Noboribetsu are the Hell Valley (地獄谷 Jigokudani) sulphurous volcanic pits and geysers, the ninja village and Bear Park. Like most coastal parts of Japan, Noboribetsu is also famed for it’s gourmet spread of seafood . 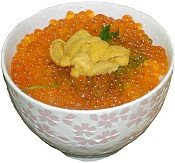 which includes cod roe, salmon roe and Onikama a type of boiled fish paste. On arrival at JR Noboribetsu Station(above), we will take a feeder bus which departs 3 or 4 times an hour from the train station to Noboribetsu Onsen(Hot Spring area) which is like the central spot for tourists to arrive in Noboribetsu. The bus ride takes 15 minutes and costs ¥330(SGD$4.30) for a one way trip per person. On arrival at Noboribetsu Onsen Bus Terminal, we will check with the office there about booking a bus for the next day to Sapporo. From what we know, there are eight daily direct express bus services operated by the Chuo and Dohnan Bus companies from Noboribetsu Onsen Bus Terminal to Sapporo Station. 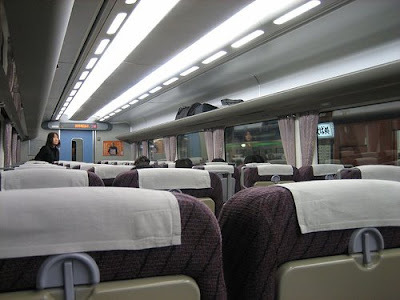 It costs about ¥1,900 (SGD$25) per single trip per person. After that, we will walk across the road to reach our hotel which is very conveniently located just directly opposite the bus terminal. We are staying at the Hotel Yumoto Noboribetsu. The central location of this hotel along Noboribetsu’s main street is justification for staying there. 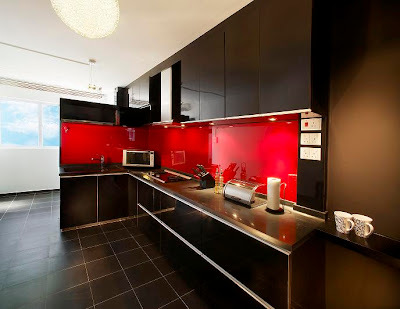 It is less than 5 minutes walking time from the hotel to the bus station, Tourist Association Office and the shopping belt. This hotel is also noted for it’s own mineral hot spring baths and 8 course Japanese dinner sets. 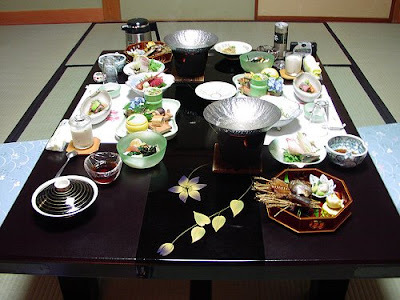 We purchased a 1 night stay package inclusive of the traditional Japanese dinner set and breakfast for two for SGD$430.00. We took up the dinner set(below) as we wanted to experience dinner as served by the hotel chef. After checking in and resting a short while, it should be around close to 1pm and so we will take a 5 minute walk up the street to the Noboribetsu Tourist Association to find out more information on Noboribetsu. The Noboribetsu Tourist Association (tel. 0143/84-3311; open daily 9am-6pm) is on Noboribetsu Onsen's main street, just a minute's walk north of the bus depot (continue up the hill; it will be on your left side with a clock above the door). 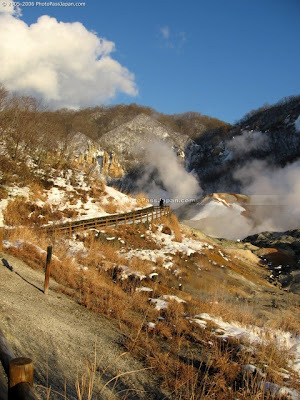 We will obtain a copy of the local tourist pamphlet "The Land of Hot Springs" with its map and hot-springs information. We read that the town is small so we shouldn't have any problem getting around. We plan to check out along the main shopping street to look for lunch. We heard that Noboribetsu has a variety of Japanese food like You ramen (noodles) shops and seafood restaurants selling fresh horse-hair crab, shrimps, clams, salmon and codfish. Casual meals like Ramen with tea (oocha) are available for ¥ 950(SGD$12.30) only. There is also a famous seafood market there where one can order fresh seafood to be cooked and served. 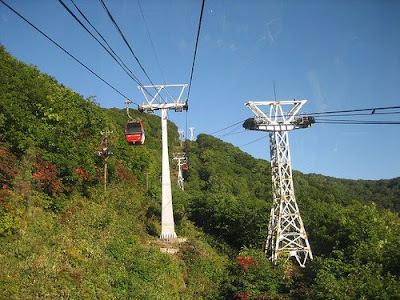 We will take then head for the Noboribetsu Ropeway Station to take a cable car(above) to Bear Park, one of the main tourist attractions there. 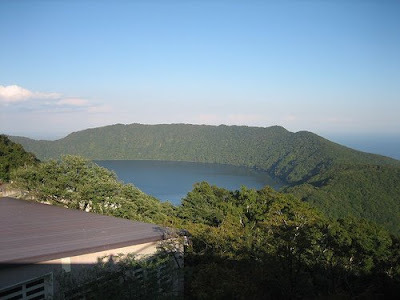 We heard that there is some nice scenery there, including a crater lake. 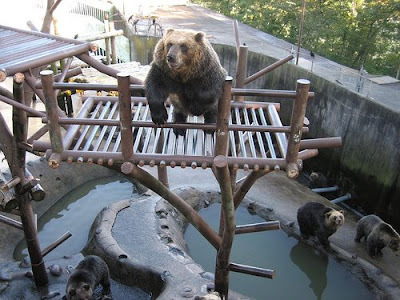 The ropeway 2 way fare inclusive of admission to the Bear park costs ¥ 2520 ( SGD$33) per person. There is a famous signage there which points to the distance to major cities in the world and that will definitely be a good photo opportunity. The lake there known as Kuttara (Below) is known as having the best water quality of all lakes in Japan with the greatest transparency known, allowing light to penetrate up to 19metres. Of course, taking a look at the 140 bears there(below) goes without saying. After an hour and a half there, we will take the ropeway down, probably taking alot of the scenery as we go down. By this time, it would be around 4pm and we would go back to the hotel and take a dip in the hot spring bath and relax till probably 6pm where we will have our 8 course dinner at the hotel. After the hour long meal, we will see if we are tired. If not, we will venture out to the shopping belt(below) again for a hour or so before returning to our hotel for a good rest and sleep as we will be leaving Noboribetsu for Sapporo the next day. For those who have more time, they can go to the Marine Park, Hell Valley, which is the remains of a live volcano(above), Date Jidai Mura(ancient Japan theme park village where you can dress up as a samurai and watch ninjas in action) in Noboribetsu. Day 2 in Hakodate, we plan to wake up early at 5plus for a visit to the morning fish market (starts at 6am in winter) for a good breakfast. 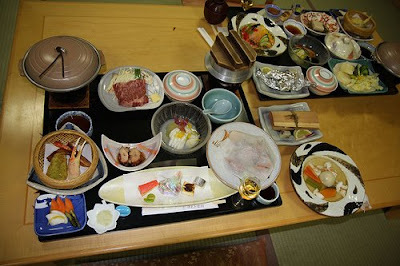 For our stay in Japan, we have booked hotel stays without breakfast as the food is so good in Japan, it would be wasteful to spend money on continental breakfast in the hotel. 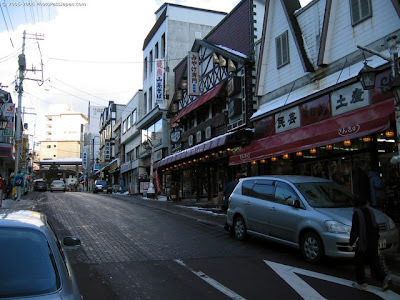 We will walk the usual route from our hotel to JR Hakodate train station since the morning market or asa-ichi as it is commonly known is just a few blocks diagonally across the station. 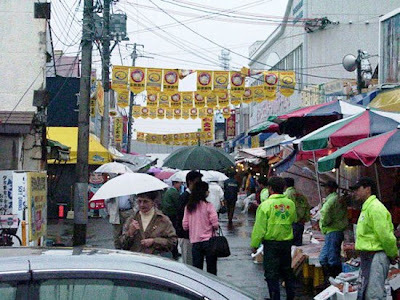 The Morning Market (朝市 asa-ichi) comprises of 360 shops along a couple of bayfront buildings,spanning 4 city blocks where there are rows of vendors and some restaurants selling a variety of seafood. The most famous seafood there are the often cited crabs. We plan to have their common breakfast bowl – a donburi(rice bowl) topped with salmon sahimi, sea urchin(uni) slices and salmon roe(ikura). If we can pack it in, we may have a try at one crab(kani), considering how huge it is. The market is open from 6am in the winter to noon. Thereafter we will walk 5 minutes away from the market to the moored Seikan Strait ferryboat called the Mashu Maru Memorial Ship, which used to link Aomori in Honshu with Hokkaido. There is a restaurant and a coffee shop at the bow. We may get a hot drink there and enjoy the scenery around the port. After that, we will head back to the JR Hakodate Train station to get our tickets to Noboribetsu if we were unable to get it the previous afternoon. 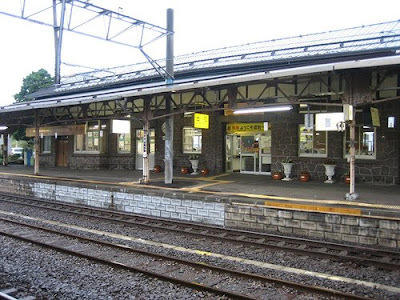 We will then return to the Tourist Office – Kanko Annaijo which is located to the north of the JR Hakodate Station for any information which we may require. Good for us, the staff there can speak English. It is open from 9am – 7pm. 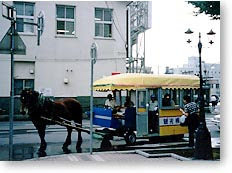 To get there by tram, drop off at the Hakodate-eki-mae tram stop. We will be planning to purchase a 1 day tram ticket pass which costs about ¥600(SGD$7.90) and is value for money . The tram day pass is also a discount card for certain tourist spots like the Ropeway to Mt Hakodate which is 10% discount wef from Dec 2007. These passes can be bought on the trams. One thing to note is that when getting on a tram, we have do so from the doors that will open up in the middle or back, and take a ticket from the ticket dispenser that we see as we enter the tram on both the right and left side. 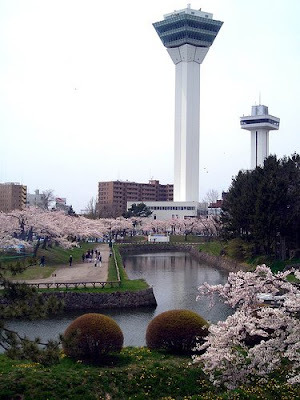 We will take a tram and then alight at the Goryokaku-koen-mae tram stop and take a 10 minutes walk to visit the Goryokaku Tower which is a 107m tower that gives a good view of the city area, Hakodate mountain and even to Aomori, the northern most prefecture of Honshu Island. Admission fee to the top is ¥840 (SGD$10.90) per adult. 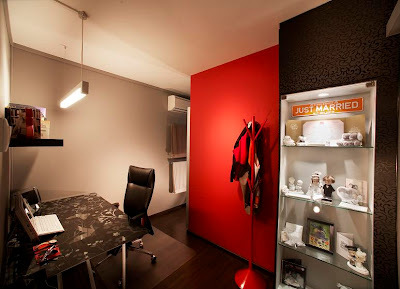 It is open from 8am – 7pm. 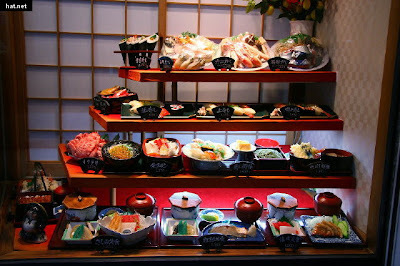 To have some snacks, we will go to Kantaro , a ‘kaiten’ sushi restaurant , meaning the sushi goes round on a conveyor belt. It is said to be much cheaper than a ‘real’ sushi restaurant but almost as good. Pricing is from ¥100 or so for 2 pieces of sushi . Located opposite the Hakodate Central Library , and just north of Goryokaku Park, no more than a 10-minute walk from the Goryokaku tram stop. It is opened daily from 11am – 10pm. Alternatively, there is also Hokuhokutei which is a short walk from the Fort Goryokaku also. Lunch is served from 11 am to 3 pm while dinner is from 4pm to 10pm. This sushi restaurant, is a good value for lunch when all plates are ¥129(SGD$1.60). After that, we will walk over to the Goryokaku Pentagonal Fort(above) nearby, which has become a famous tourist spot. Built by the Tokugawa shogunate to guard attacks from the northern region, this fort became the battleground for the Battle of Goryokaku. Being Japan's first western-style fort, Goryokaku is characterized by its star-shaped pentagonal structure. 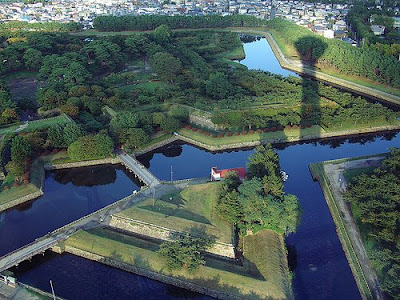 Today, the fort is has become a park featuring Goryokaku Tower and the Hakodate City Museum Annex. It is a pity that we are there in winter for in the spring, the area is covered with cherry blossoms that bloom from 1,600 trees. 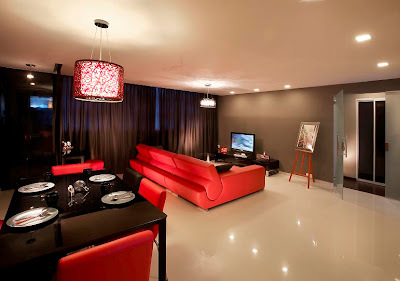 By now it would be lunchtime and I plan to take Gayle to a Japanese restaurant with French style cooking – La Tachi which I heard serves some fine food with Japanese flair. We will probably take a ¥1,000(SGD$13) taxi ride from Goryokaku to soothe aching legs. Lunch is served from 11.30am to 2.30pm and dinner is from 5.30pm to 8.30pm. We will then return by tram to Hakodate Eki-mae stop and head for the police station opposite JR Hakodate Station, to be in time for the last run at 2pm of the Horse carriage tour of Hakodate(below).It would be a good respite to rest our legs while we take in 22 tourist sights along the tour which will take about 2 ½ hours. The first run starts at 11am followed by three more runs each hour with the last at 2pm. 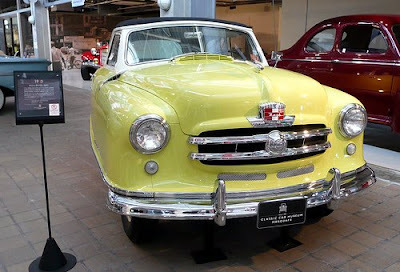 After the tour ends, me being a car enthusiast, we will walk over to the nearby Classic Car Museum of Hakodate(Below) which is situated within a building complex on the Hakodate bay side. It traces the history of vehicles from a horse-drawn carriage made in 1750 to the automobiles of the 1950's, and also exhibits classic cars such as small-sized sports cars and a nostalgic T-Model Ford. The collection includes over 200 vehicles, and there are approximately 60 cars on constant display. Admission fee is ¥1,000(SGD$13) per adult. 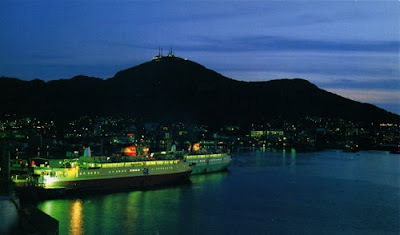 If there’s time, we will take the Blue Moon Bay Hakodate Bay cruise. The 40 minute ride will be a relaxing way to end the day. It costs ¥1.600 ( SGD$21) and departs from the harbour near the Red Brick Waterfront warehouse (Aka Renga Soukogun). It comes with a complimentary soft drink. We will probably only be in time to catch the last cruise at 5pm. To take a tram there, drop at the Suehiro-cho tram stop. 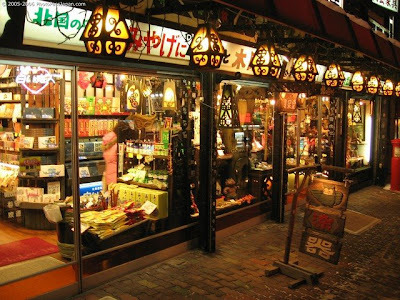 By now, it would be dinner time and after some research of eateries in the Suehiro area where teh cruise docks, we have narrowed down to two possibilities. If we still gave a penchant for French food, we can head for Poisson, a chic French restaurant that has a 1930s feel, opened for dinner from 5pm. Alternatively, if we crave for Japanese food, we could head for Tenya , a good traditional tempura restaurant. It costs ¥700(SGD$9.10) for a tendon - a bowl of rice with some tenpura on top or ¥2,000(SGD$26) for a tokujo tenpura teishoku featuring the best quality tempura with soup and rice. It is opened from 11.30am – 9pm(break from 3pm – 5pm ) except for Tuesday when it is closed. Those taking the tram can drop off at the Horai-Cho Tram Stop. 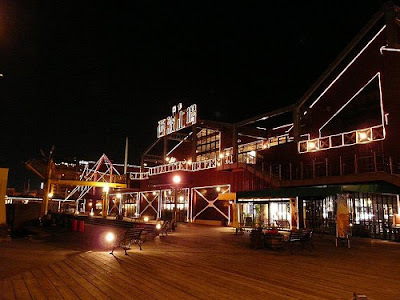 We will probably walk around the the Red Brick Waterfront warehouse (Aka Renga Soukogun) and grab some burgers for supper back at the hotel, from Hakodate’s burger chain – Lucky Pierrot. The place is easily recognizable because of its circus theme, which includes a big picture of a clown on the front of the restaurant. Burger prices start from ¥315(SGD$3.90) for a chicken burger. Then it’s back to the hotel for a good night’s rest as we will be heading for our next destination - Noboribetsu the next day. Our shih tzu - Shayna is now 4 months old.Looking through all her photos, she has really grown. She's also showing some teenage behavior where she is quite rebellious and playful and needs very firm control to calm down. We have been scouring around for toilet roll cores as she seems to like chewing on it and it is the cheapest biting toy we can find which is also good as we can replace it before it become unhygienic unlike the usual toys which will become dirty and dusty. She likes us to play 'fetch' with her(above), with us throwing the toilet roll and she fetching it back to us. 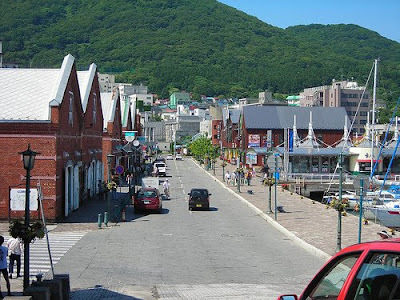 Located at the southern tip of Hokkaido, Hakodate is a port city that was one of the first points of direct contact with the Western civilization in Meiji Japan when Amercian warships sailed there in 1854. This Western influence is evident today in the historical designs and architecture especially in the Western Area to this day. These cityscapes and the night view from the top of Mt. 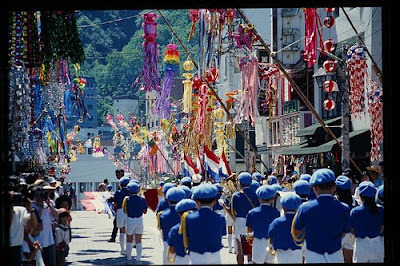 Hakodate, fresh and abundant seafood and hot spas are what attracts about 5 million visitors annually to Hakodate. Temperature for December is expected to hover around -1.9 degrees celcius. On arrival from Singapore, we will take a domestic JAL flight from Osaka Kansai Airport to Hakodate Airport. On arrival at Hakodate airport at 1.30pm, we will take a 20 minutes shuttle bus service (300Y(SGD3.80) per pax) by the Hakodate Teisan Bus company from the airport to JR Hakodate Train Station. The train station houses the tourist information centre(Opening hrs: 9am - 7pm) which will be our first stop as we get information and maps and orientate ourselves. We will also see if we can make advance purchase of train tickets ( heard it is priced at 6500Y(SGD83) for a one way trip per pax ) to our next destination Noboribetsu. We will take a leisurely 15 minutes walk from the station to our hotel - Hotel Royal Hakodate. We will take a short breather after checking in and most probably leave for Mt Hakodate at 4.30pm. 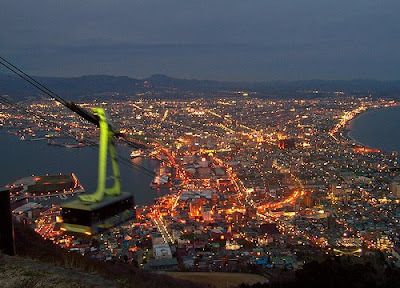 The plan is to go up to Mt Hakodate to catch a bird eye view of the city which will make some pretty good snapshots. 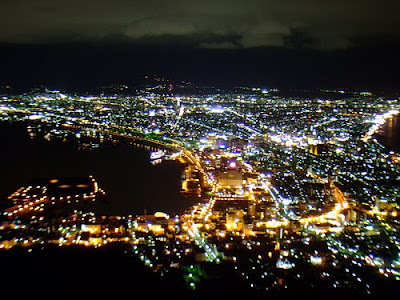 Hakodate is supposedly one of the world three major ' million $ night view' in the world besides Naples and Hong Kong . 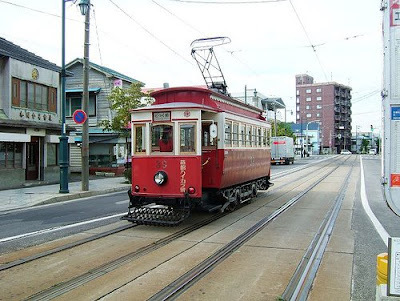 We will walk to Hakodate Tram Station which is 10 minutes walk away. There we will take a tram down to Jyuji-Gai Tram Station and then alight there to walk to the Mt Hakodate Ropeway Station, all in all taking 20minutes. There, we will be taking some shots while waiting for the ropeway gondola to bring us up to the peak in 3 minutes. There is a gondola ride every 10 minutes. Return trip costs 1160Y per pax(SGD 14.80). There are shops and restaurants at the peak but we will be there more for the view. We will probably shop and look see look see. The restaurants have a good view there but we think that that the food and pricing is not to our liking though. We could get a better meal elsewhere in the city. Would however be good for those who want a romantic candlelight dinner with a beautiful view. We will probably linger till 7pm to catch the view as it merges from daylight to night. the hotel to take a good rest as we plan to wake up early for the 6am morning market to grab some fresh salmon sasimi and sea urchin for breakfast! More on our next posting! 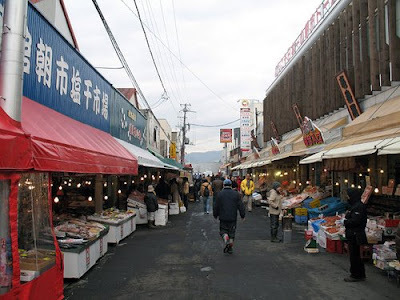 Hakodate's morning seafood market ! Yummy !